I recently picked up Dream Gardens Across America, a special publication magazine by Better Homes and Garden. I enjoyed perusing the beautiful pages filled to overflowing with gardens across America. I found something puzzling and disturbing in these pages. A big piece of the picture was missing--there isn’t one mention of who owns or designs the gardens. There are many credits handed out. On page one, credits go to editorial director, editor in chief, art director, editor designer, contributing copy editor, contributing proofreader, contributing writers, editorial assistant, vice president and publisher, advertising director, executive vice president and vice president and general manager. In each article about the garden credits are given to field editor and writer. But the most important credit is missing—the garden creators. 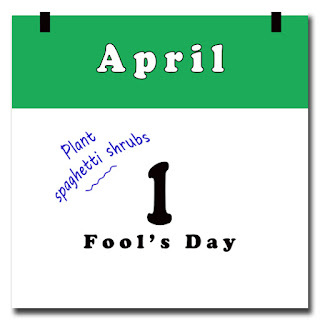 They can mention a proofreader, but not the owners of these dream gardens? This oversight, whether intentional or not, seems odd to me. Gardens are a reflection of the ones who own them—an investment in time, creativity, perspiration, and money. It's like reading a book filled with pictures of art, giving credit to everyone involved in making the book, but without mention of the artists who created the art. Isn't it an insult to tell a story and leave out the men and women behind these wonderful gardens? Come on editors and publishers; give credit where credit is due. There are some foliage combos that are so outstanding. Here is one I recently enjoyed in another garden. This is Acer 'Autumn Moon' and the perennial, Impatiens omeiana. I was going to plant my own Autumn moon with Asarina procumbens at its feet, (the snapdragon-like yellow flowers bloom about the time of the new foliage.) but perhaps I need to rethink the combo, or add in another foliage to the ensemble. Feast your eyes out. I am smitten. When a new Heuchera leaf color combination comes out, I feel like a kid turned loose in a toy store—I want to let out a whoop, jump up and down, and clap my hands. Over the years, I have photographed and photographed again, written and rewritten about them, for I am hopelessly hooked. I swear plant breeders know my addiction and like evil drug dealers, they toss more cultivars into the plant market with a new twist, a new variegation, a new color or combination of colors. They feed my affliction. Purple, gold, mahogany, peach, apricot, yellow, fuchsia, black, and every shade of green on the planet, are all hues that can be seen in the leaves of coral bells. 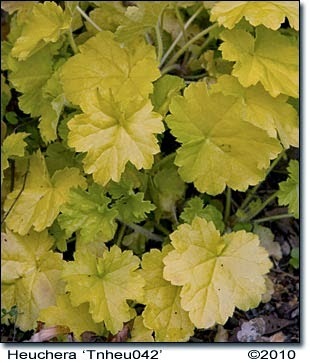 Take Heuchera 'Monet'; the leaves look as if an impressionist painter laid down splashes of various hues of green. H. 'Mahogany' appears with every leaf a different shade of tan, mahogany, and shades between. 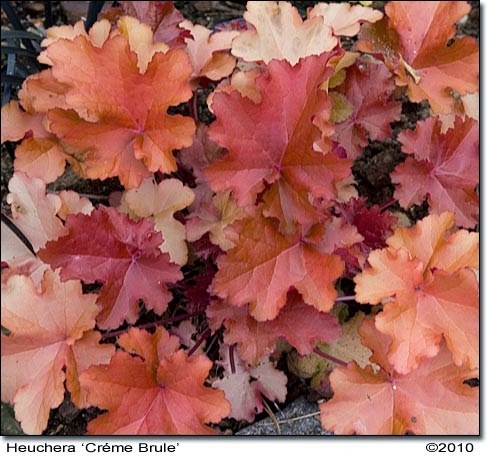 H. 'Crème Brule' is similar but with warmer hues. 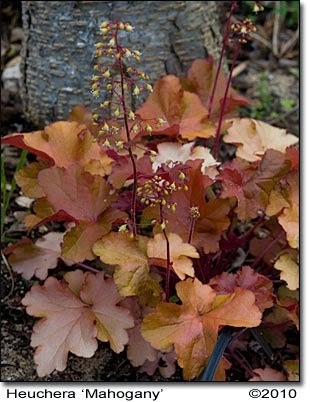 Many of the cultivar names are very descriptive; however, Heuchera 'TNHEU042' seems like a strange name. Its registered trade name—Dolce Key Lime Pie—would be better as its cultivar name, as it does come in shades of lime, chartreuse and yellow. 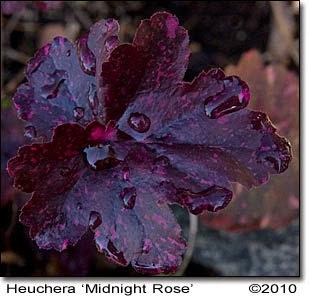 My favorite of all coral bells is Heuchera 'Midnight Rose'. It was love at first sight when I first laid eyes on her. All I could do was stare at her lovely, ebony leaves splashed with rose. I had to make her mine. She now resides in my garden where I visit her daily at her perch on top of a low basalt wall with native gray sedums at her feet. She's been my favorite now for two years; no other Heuchera has bumped her from the number one position. I'm keeping my eyes wide open; I know those plant pushers are going to keep trying to find me a new love. Copyright Rainy Side Gardeners (rainyside.com)All rights reserved to authors/photographers. Simple theme. Powered by Blogger.